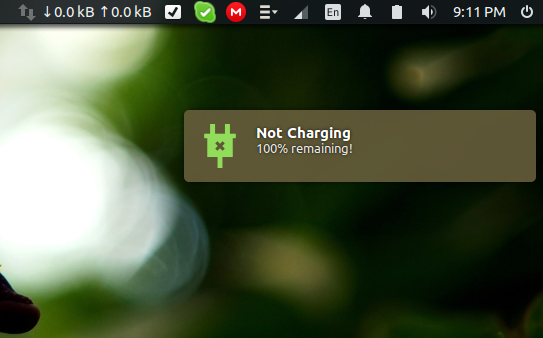 A utility tool, notifies user about charging, discharging and not charging state of the battery on Linux. Battery Monitor is a utility tool developed on Python3 and PyGtk3. It will notify user about charging, discharging, not charging and critically low battery state of the battery on Linux (Surely if battery is present). To use Battery Monitor you need these dependencies installed on your PC. That’s all. Battery Monitor Stable is installed on your system. That’s all. Battery Monitor Beta is installed on your system. Every time, you will start/restart your PC, it will run automatically in background. But as it’s your first time, let’s start it by yourself. Please, search for Battery Monitor launcher in your menu entries. Then simply click on it. You will get notified that Battery Monitor has started. 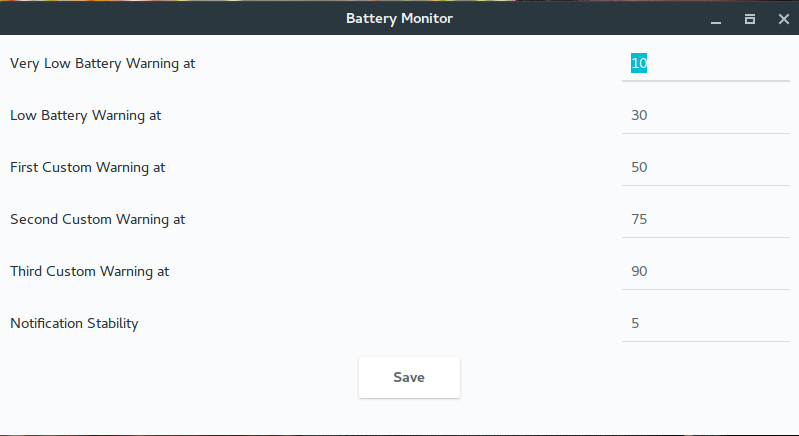 If you want to adjust settings for Battery Monitor, then simply search for Battery Monitor GUI in your menu entries. Then click on it and you will see a new window. Now adjust your settings and save it. Your adjustment will be in action after next reboot. Please take a look at our milestones to get clear idea about our roadmap. They are dynamic and they can change frequently on user requests. [x] Support for Ubuntu 17.10 has been added. [x] Introduced a Test feature for developers. [x] Developed a GUI to manage the custom warning easily. [x] Added Makefile for easy installation and upgradation. [x] Support for Ubuntu 14.04, 16.04, 16.10 and 17.04 has been added. [x] Reformatted the code in a new style. [x] Optimized the code in a way so that Battery Monitor consumes a little resource of your PC. [x] Fixed issue #4, Added warning at 30% battery life (temporary solution, will be replaced by a GUI in near future). [x] Fixed issue #6, Added an entry in dash. [x] Added Critically Low Battery warning when battery is below 10%. [x] Added ctrl+C pressing support to stop the battery-monitor command on terminal. One of the biggest contributor of Battery Monitor. He has reformated the code in a new style. The style represents the code easier to understand. Also he has optimized the code in a way that Battery Monitor consumes a little resource of your PC. Please take a minute to thank him. Another biggest contributor of Battery Monitor. He has fixed some bugs and optimized Battery Monitor in a way so that it consumes lower CPU and RAM than before. Please take a minute to thank him. battery-monitor is maintained by maateen. This page was generated by GitHub Pages.